How much does it cost to move a 500 pound rock? We all know theanswer: It depends on how much you want to spend. If money is no issue, a big tractor delivered to your house can move the boulder with ease. However money is the issue. The smart answer is to search out the best, affordable solution. A few years ago I hired some athletic, teen-aged boys with muscles to help me arrange some big boulders in my landscape project. I told them where we were going to put the boulders and they proceeded to try to lift, shove, and push them into place. Gravity won. So I picked up my steel pry bar and showed them that knowledge and experience could do what their young muscles could not. The pry bar and “leverage” moved the boulders. What’s the point? Big money is not always the only answer to simple problems. The best proven energy-saving concepts do not take much money. They do, however, take knowledge and experience. Most energy-saving technology comes from the people who sell products and services. And they are correct when they tell you what their products and services can do. The John Deer tractor salesman is right. His tractor can do the job with ease. And sometimes the tractor is the best answer. But in the home energy savings game, the $10 piece of pipe used as a pry bar may get the same solution. If the goal is to save energy, be more comfortable and healthy then some very inexpensive things have the greatest payback in all three of these areas. The things in your house that steal your energy dollars were not well understood until just a few years ago. These thieves were hidden out of sight. Then came the invention of the Blower Door, Duct Blaster, Infrared Camera and a host of other high-tech testing tools. The energy losers were exposed, and the good news is that in many cases they are easy to fix. All you need is the right tool, like the pry bar. The strategy provided is not some “pie in the sky” off the chart exaggerated target. It is from the proven Energy Star program and the IECC 2009 Energy Code. This code is currently part of the current IRC 2012 local building code, but not yet implemented.. The purpose of the Energy Strategy Study is to help your contractor guide his subcontractors through the mountain of possible energy efficient choices so they can construct a balanc ed energy efficient system with minimum cost to you. It starts by design. Many energy losers are simply designed out of the house. le as caulking certain framing members, to capping or sealing holes to the attic. We also identify bigger areas of concern and give solutions to things like foundational insulation, and HVAC methods that make a major difference. We write this booklet to guide you in key details on energy concepts like insulation, caulking and sealing, HVAC system design, advanced framing, as well as a simple explanation on the thermal bypass issues identified in the drawings. We provide a System Select or “short spec” sheet on the energy saving components you need. We provide the parameters of control for the products you are going to use so as to balance the entire house’s energy saving system. Spending too much of your energy budget on one good thing is like wearing an artic parka and sandals in a snow storm. 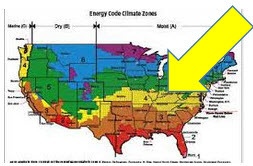 The Energy Strategy Study is based upon our Zone four, the yellow strip in this climate map. In the US, we are unique in how we should build in our mixed, humid zone. Every decision in the study is based on our humid and rapid changing climate in which we live here in the Ozark Mountains. The Study answers questions like: What should you insulate? What is the best kind of insulation and R-value for each area of your house? What U-value should you seek for your windows? What about moisture? What about ventilation concerns in a tight house and what to do? What kind of SEER rating should you seek for your HVAC system? Do I need an ERV? Are light bulbs and fixtures part of the puzzle? We give you the data needed to make the best selection of products to give you the best energy saving results for the money you will spend. The purpose of the Energy Strategy Study is to help you become your own energy inspector. (You can add, at an additional cost, a certification such as a HERS Rating, Energy Star Three, or NGBS and have us do field inspection and testing for you.) Included in this Energy Strategy Study we remain your consultant as you make the choices. For example, your insulation installer may suggest alternate approaches. Your question may be, “Is it worth the difference in cost?” Since we are not selling you the product or service, our answer will be based only on building science. The answer is often yes. Many suppliers and subcontractors offer great upgrades at minimal cost. However the energy strategy designed must be applied to keep the system in balance, both in cost and performance. For example: a major change in insulation could result in a major change in HVAC sizing and design or the change could create a moisture problem in years to come. These five parts of the Energy Strategy Study give you and your contractor the information to build a better house. It leaves you in control of how you build, but provides the latest proven methods for you and your specific house design.